Co-founder of tacotruckscolumbus.com, alteatscolumbus.com and streeteatscolumbus.com. Bethia is also co-owner of Columbus Food Adventures and writes about food for Columbus Monthly. 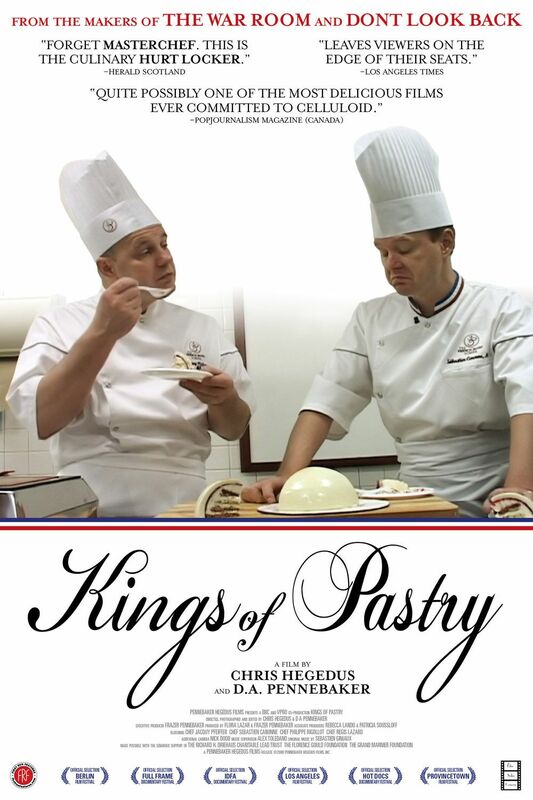 Kings of Pastry is showing until October 7th at the Gateway Film Center. I highly recommend seeing it while you can. It is a quirky, touching, funny and overall captivating documentary about 16 chefs competing in the prestigious Meilleurs Ouvriers de France MOF) competition. This is the Olympics of French patisserie, a three day competition that takes place every 4 years and involves years of planning and months of practice and preparation. The documentary closely follows three of the competitors (one of whom is based in Chicago), giving insights into the grueling competition and it’s toll on the competitors. For the winners status, validation and jubilation and for the losers despondency and the question of whether to devote another 4 years of their life to a second attempt. At times the pressure of the event is hard to watch and you will develop a profound appreciation for the fragility of sugar. You don’t need to be an avid baker to enjoy this movie. It’s more about craftsmanship, the pursuit of excellence and intense competition. While the arena is pastry rather than athletics, the physical and emotional toll is the same. Some additional pointers- This is not a movie to watch hungry. The Gateway Film Center has a cafe serving sandwiches and other food which you can take into the theater. They also have 20 beers on tap. Wexner members can watch the movie for $5. 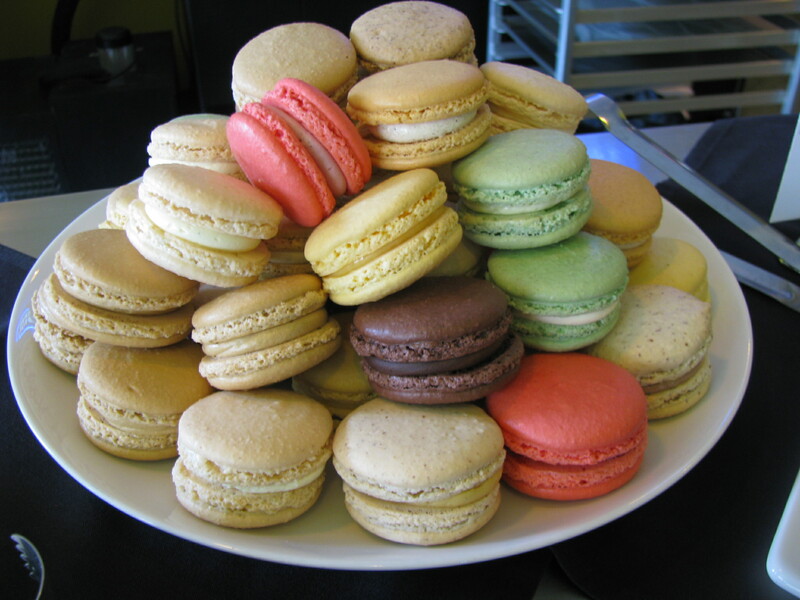 Today’s matinee was accompanied by a reception hosted by Pistacia Vera and watching the documentary renewed my appreciation for the skill and precision that goes into each macaron or slice of gateau. Thanks to Pistacia Vera for such a wonderful spread. You may have noticed that there are a lot of ‘Taste of…’ events in September, including some pricy fundraiser events, like ‘Taste the Future’. 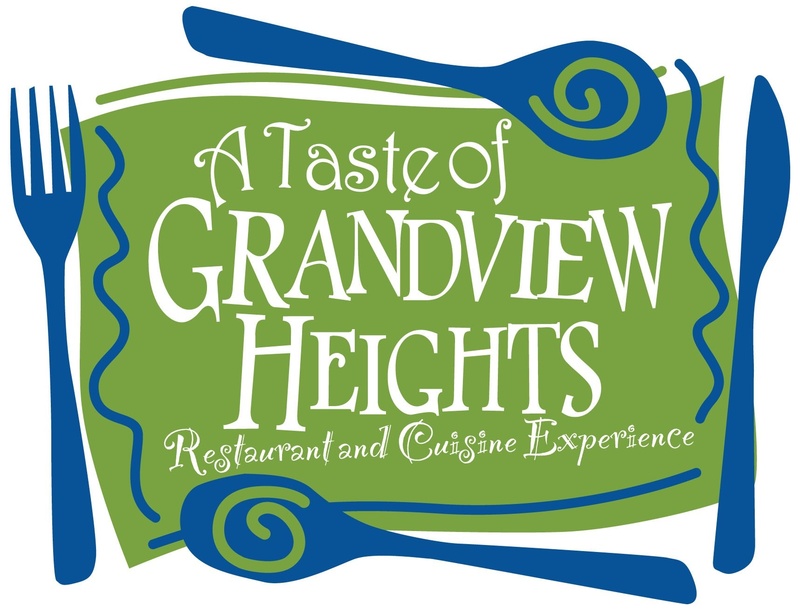 Following close on their footsteps next weekend is the far more accessible Taste of Grandview Heights on Sunday October 3rd from 2-7pm at McKinley Park, 1661 Goodale Boulevard. Unlike the others, there is no three-figure entry fee – you simply purchase whichever dishes catch your fancy. The Taste of Grandview Heights will showcase almost 20 restaurants and food vendors, with each offering appetizers, entrees or desserts (or any combination thereof). Many of the Grandview area restaurants will be represented including Third and Hollywood, Grandview Cafe, Mazah, Trattoria Roma, Noodles, Hoggies, Minuteman Pizza, Jeni’s and Stauf’s. Some restaurants from neighboring areas such as Cap City Diner and the Fish Market will also be in attendance. In other words, there will be just about something for everyone. I was lucky to be included in a preview event last week (it was fun to be on a food tour organized by someone else!). We made a staggering nine stops and really experienced the wide range of restaurants in the area, and sampled some of the dishes that will be on offer at the Taste of Grandview event itself. 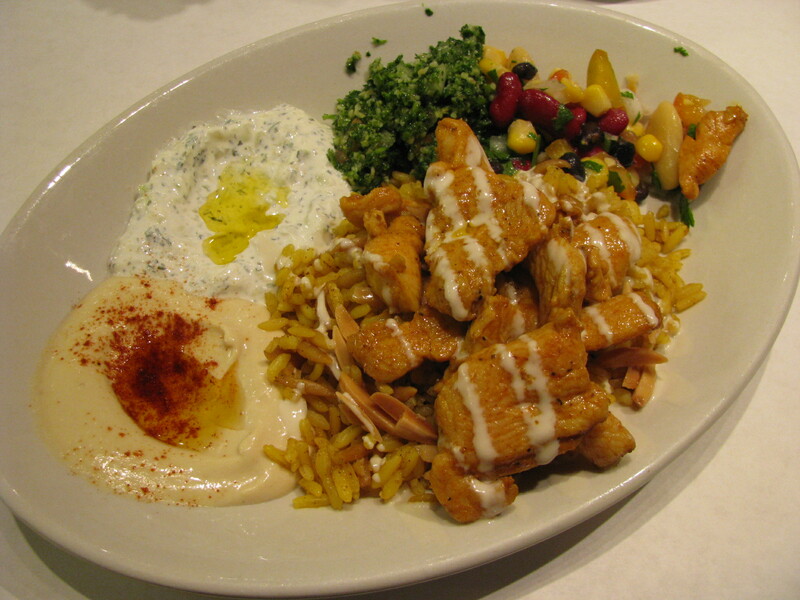 The sampler plate from Mazah. I thought the tzatziki and tabbouleh were particularly good and the hummus was amazingly smooth. Their baklava sundae was also a crowd pleaser. 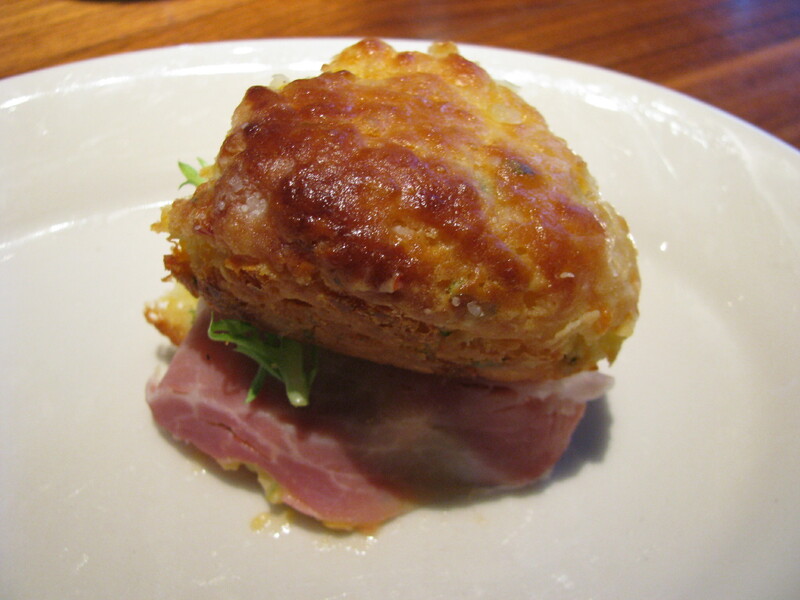 The delicious signature cheese biscuit from Third & Hollwood filled with their pimento cheese spread, frisee and Tennessee ham. It is probably worth going to the event just to search out this rare treat (hint – it’s not on their regular menu). The Grandview Cafe showed that you don’t have to head downtown to satisfy a hotdog craving – they use Nathan’s Famous Franks and get their New England style buns from the Orlando Baking Company in Cleveland. 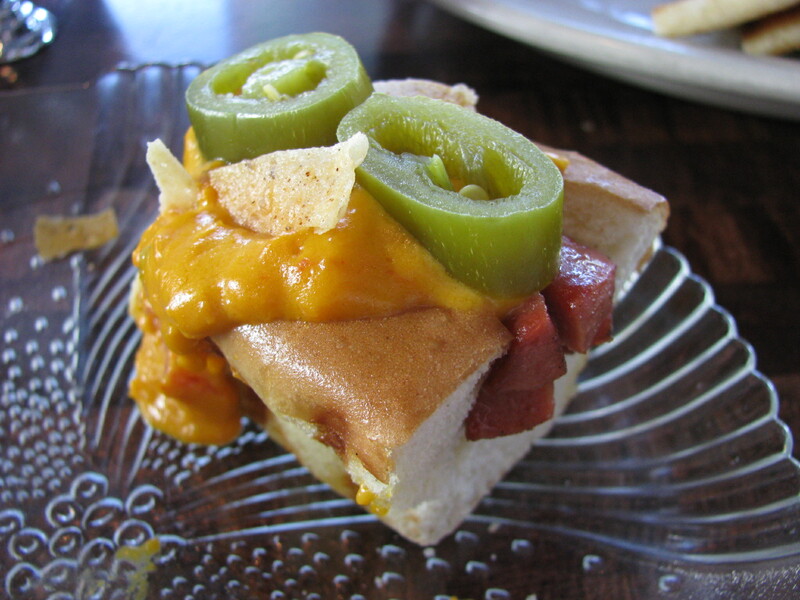 They used us as guinea pigs to test their new stadium dog topped with nacho cheese sauce, pickled jalapenos and crushed tortilla chips. It seemed to be a winner. We also had some exceptional scones and pretzels at Stauf’s, some or all of which I expect to also see at the event. You can get more details about the event on Facebook or Twitter. I hope to see you there. 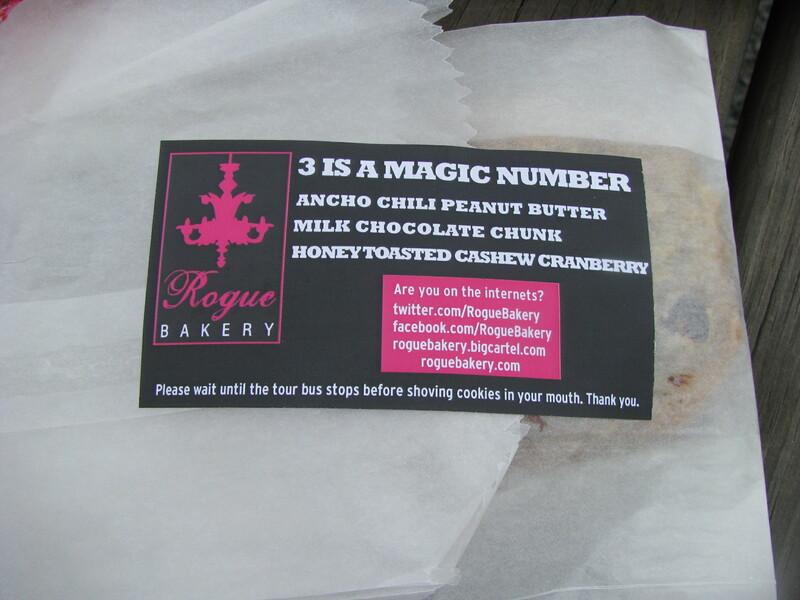 If you are an avid twitterer in Ohio you have probably come across @roguebakery. 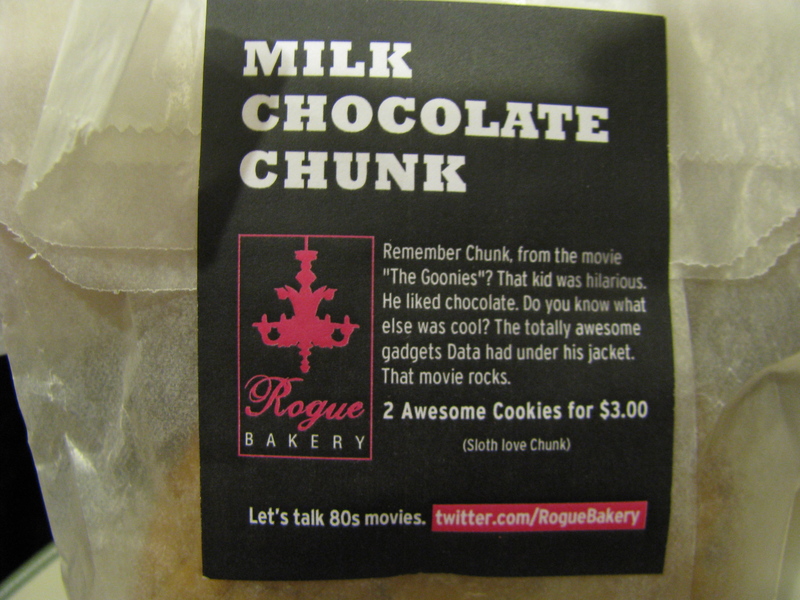 Rogue Bakery is not a conventional bakery with a store front and they don’t advertise. It is more of a secret cookie club spreading by word of mouth on social media, and knowing the secret is part of the fun. 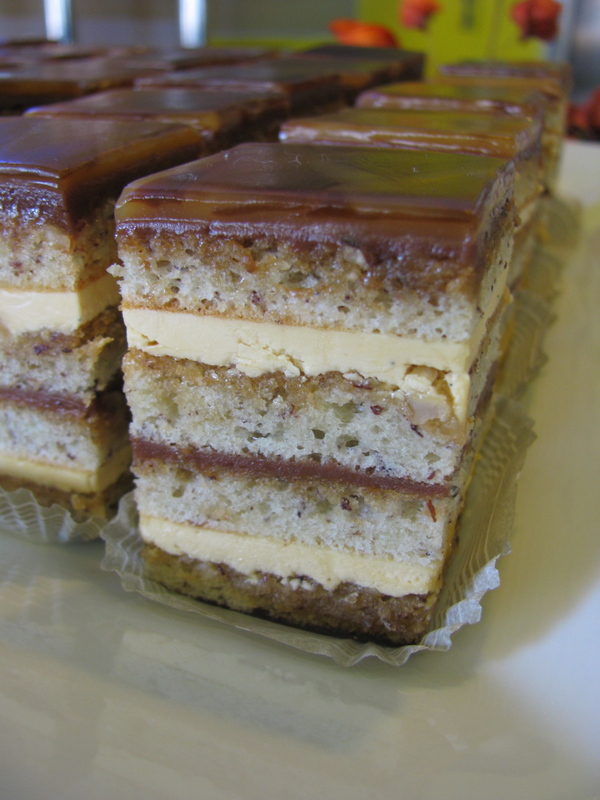 Like Columbus Food Adventures, Rogue Bakery is a business born from unemployment. Owner and baker Carl is an engineer by trade, who’s been baking cookies for friends and decided to start selling them. 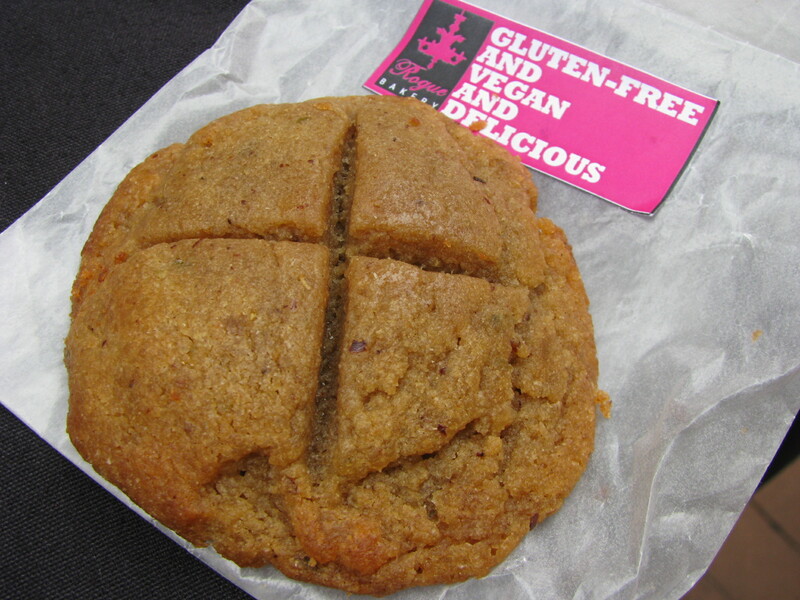 The cookies, baked in a church kitchen in Cleveland, are made with as many locally sourced ingredients as possible. Order your cookies by Friday night, pay online (via facebook) and if you are lucky enough to live in Columbus or Cleveland the cookies will magically be delivered to your door on Saturday. 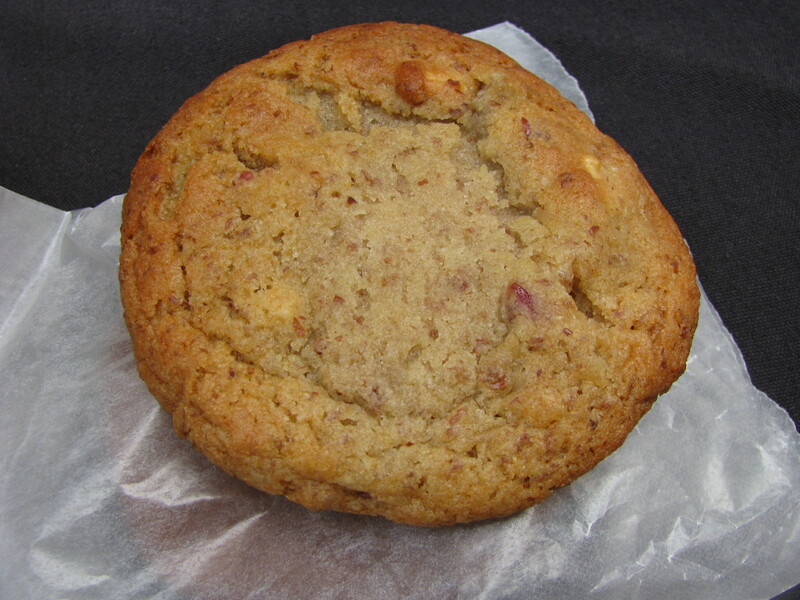 If you order 2 dozen you can also get a 1/2 gallon of Snowville milk delivered with your cookies. Mail order (without milk) is under beta testing. Cookies are $15 for a dozen and choices include an experimental dozen, 12 of a favorite flavor or a gluten free or vegan selection. Flavors include: Ancho peanut butter, I’m not a snickerdoodle, honey toasted cashew cranberry, chocolate liberator, milk chocolate chunk, shape shifters, oatmeal dark chocolate pecan cherry and experimental flavors that vary each week. I’m not a snickerdoodle is one of the most popular, but I’m all about the oatmeal and the honey toasted cashew. If you think that nothing could be better than having fresh baked homemade cookies delivered to your door, there’s more. 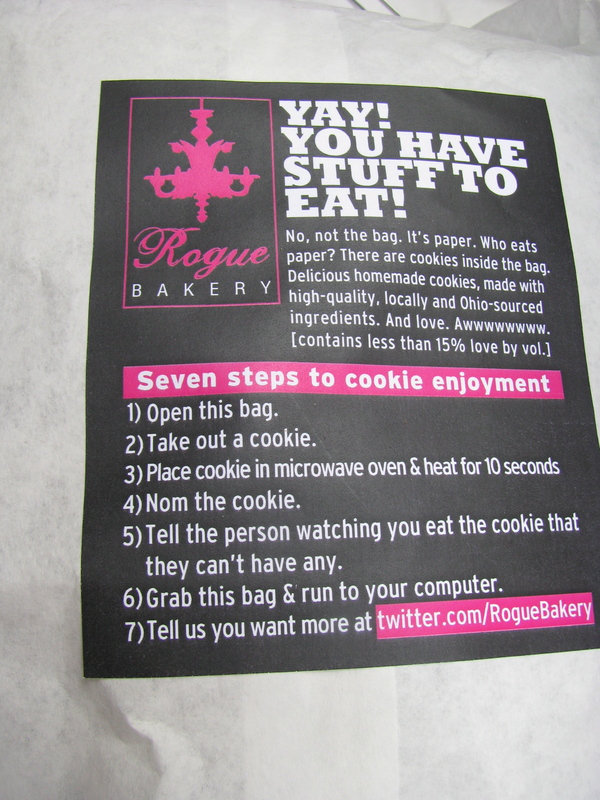 While the cookies are good, I get as much enjoyment from reading the quirky labels. The cookie descriptions are not your average hyperbole. As you can tell from the photos, Carl has a sense of humor and labels may say anything from ‘we like rainbows and unicorns’ to ‘turkey on a cookie? yes or no?’ Carl claims that his cookies are made with ‘less than 15% love by volume.’ I would say that they’re made with more than 15% laughs. Carl’s quite obviously a twitter addict who likes to interact with his customers on a wide variety of cookie and non-cookie related topics. Are you awesome? Are you having relationship issues? My favorite label is the custom one he designed for our Ohio River Valley wine tour picnic. Please wait until the tour bus stops before shoving cookies in your mouth. Thank you. While I was out of work the library was a wonderful place. I could borrow books and movies without worrying about spending money I didn’t have. I could test out new cookbooks, escape in some fiction or research career options. Here’s a post I wrote about my library love last year. Now the library is a great resource for books on the history of Columbus, marketing, small business start up and a wealth of other topics. We are extremely lucky in Columbus – we have one of the best libraries in the country. We can order books online and get emails telling us when they are ready to collect. We can watch our favorite TV shows and attend free programs on grants, job hunting, small business. That’s not to mention the great programs that they have for kids. But our library’s funding is under threat. “Because of state cutbacks and other funding reductions, Columbus Metropolitan Library’s [CML] budget has been cut by $11 million since 2008, forcing the library to reduce hours at all locations, reduce staff by 160 positions, reduce book and reference materials budgets, defer maintenance, delay technology upgrades. To protect the services we provide to the community, we are placing an operating issue on the November ballot. The issue will replace the original 2.2 mills and adds .6 mills to help make up for the huge cuts by the state. It has been 24 years since CML has had an increase in local funding”. On November 2nd, please vote FOR the Columbus Metropolitan Library. Please support our public library and help to keep it number 1. Have you ever tasted a pawpaw? If the answer is no, then you should make plans to head to the Ohio pawpaw festival next weekend. Pawpaws are the largest native fruit in the United States and the official native fruit of Ohio. They are also an Ark of Taste fruit. They grow on trees in woodland areas in Ohio and 25 other states and have a pale green skin that turns yellow as they ripen. They are amazingly tropical for something that grows in Ohio and are like a cross between a custard apple, mango, guava and banana. 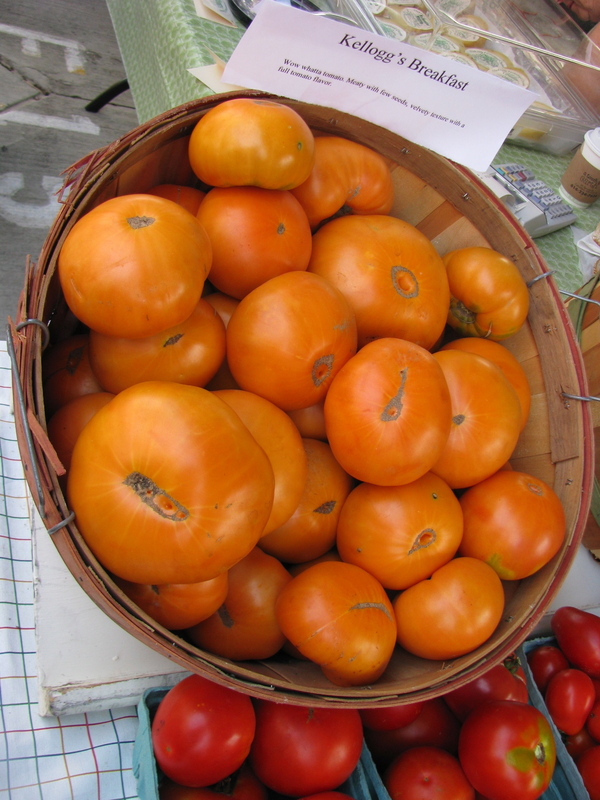 The flesh is creamy yellow but have a lot of seeds and bruise easily so aren’t popular commercially. The pawpaw festival offers all sorts of pawpaw treats and activities. Here’s my account of last year’s festival. I will be there on Sunday judging the pawpaw cook-off contest at 1.30pm. Here is the schedule of the rest of the weekend’s activities. 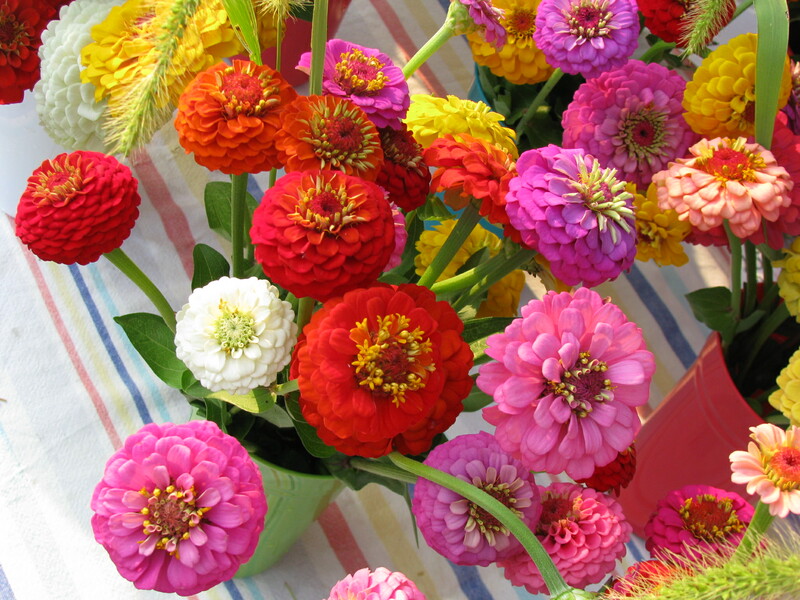 You can also combine your visit to the festival with a visit to the Athens farmers’ market, an O’Betty’s hot dog or some of the other great restaurants there. There are some other Athens ideas here, here and here. The pools are closing, the kids are back in school and yesterday I saw pumpkins and apple cider at the farmers’ market. It’s officially the end of summer. For me it seems to have gone by in a flash – I’ve been going full throttle all summer on our new business start up – Columbus Food Adventures. We officially launched in July and the summer has been a whirlwind of tours, promotional events, emails and learning how to run a business. So far, it’s been a lot of fun and we are enjoying sharing some of our favorite foods and culinary experiences with adventurous food lovers. With hindsight a couple of decisions I made in the spring were mistakes – signing up for a CSA and joining a pool. I’ve been too busy to do much cooking or eating at home, and lazy afternoons with a book have been been extremely rare. Each week, I have diligently collected my CSA, felt guilty about the vegetables in the fridge, packed the freezer with fruit and lamented all the things I wish I had time to cook. As well as the tours, there have been lots of research trips, meals with friends and the launch of another new blog – streeteatscolumbus.com . Columbus is undergoing a street food explosion with new trucks appearing every week. Street food has been a theme for us this summer. One of our favorite new street food vendors is Foodie Cart and we especially love it when they set up outside Mouton for breakfast. Here is Misako preparing one of their creative Japanese crepes. One of the other things that I haven’t had enough time for this summer is blogging. There have been lots of events and meals that I wanted to post on hungrywoolf that never made it online. One of them was the Food and Wine celebration, a fundraiser for Veggie U at the Culinary Vegetable Institute. I was extremely lucky to be offered a free ticket at the last minute. We had some amazing food, celeb spotted, watched a cooking demo by Jonathan Sawyer, hung out with the fine folks from Jeni’s ice creams, and ate and drank the night away. 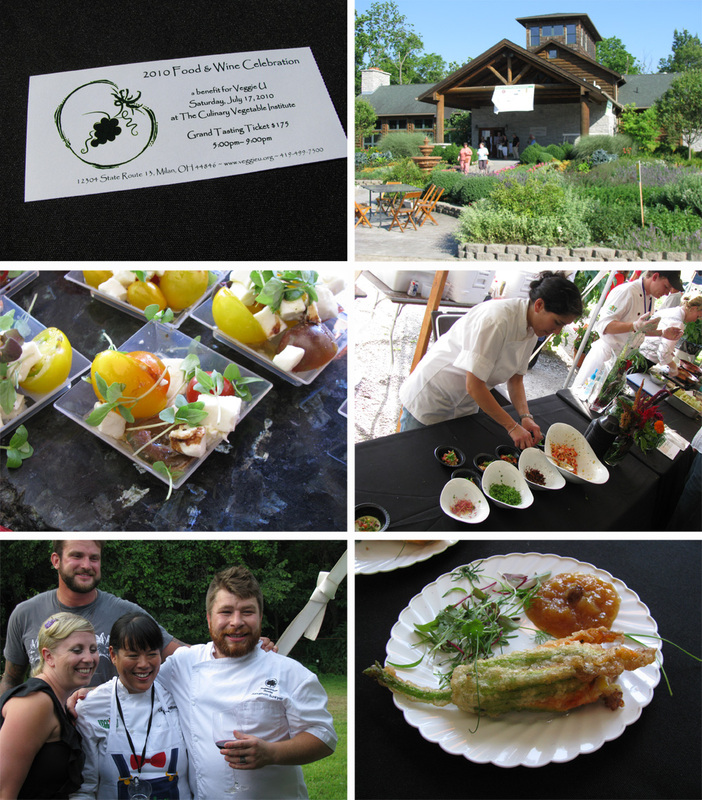 Slow Food Columbus out did previous years with two wonderful open air dinners in 2010. The stunning Girasole dinner, kindly hosted by Val Jorgensen was a fundraiser for the Terra Madre delegates. 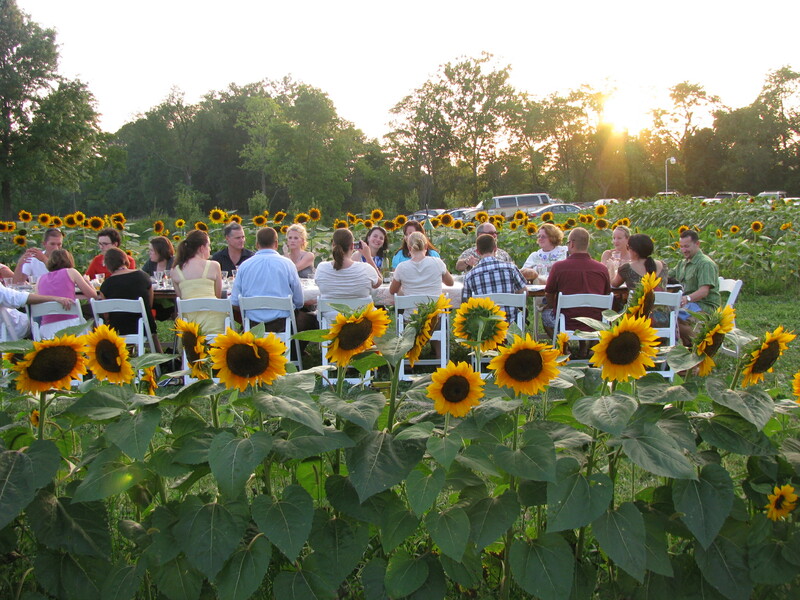 It was an amazing banquet with a long table set between two rows of sunflowers. More photos including lots of food shots here. 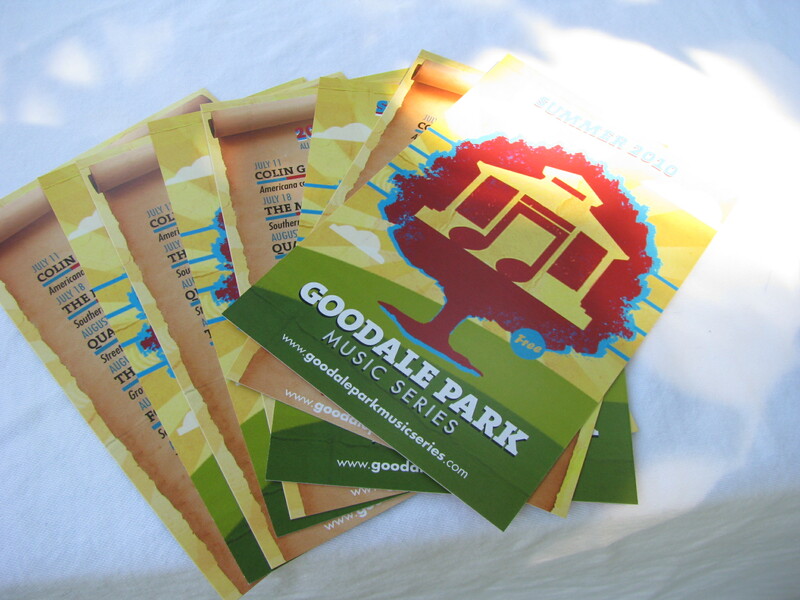 This summer the organizers of the popular Goodale Park music series experimented with a series of community potlucks hosted by local blogs and themed to fit with the music. I was involved both with the taco trucks themed pot luck and the hungrywoolf ‘Grown in Ohio‘ potluck. Great music, friends and food. Other fun food (and even some non-food) related events were a day at the state fair where I ate pig wings and deep fried mashed potatoes; Pecha-Kucha under the stars; Shadowbox’s open air showing of ‘Back to the Garden’ at Schiller Park; the Doo-dah parade (and the adventures of the keg-bike); Roman Holiday al fresco at the Wexner Center; lots of bike rides courtesy of Mr George and Mojito-Madness the brain child of CMH Gourmand. Mojito madness was a quest for the best mojito in the city which necessitated many hours of drinking and lots of tasty snacks to keep the team motivated. It was hard work, but I was happy to help. 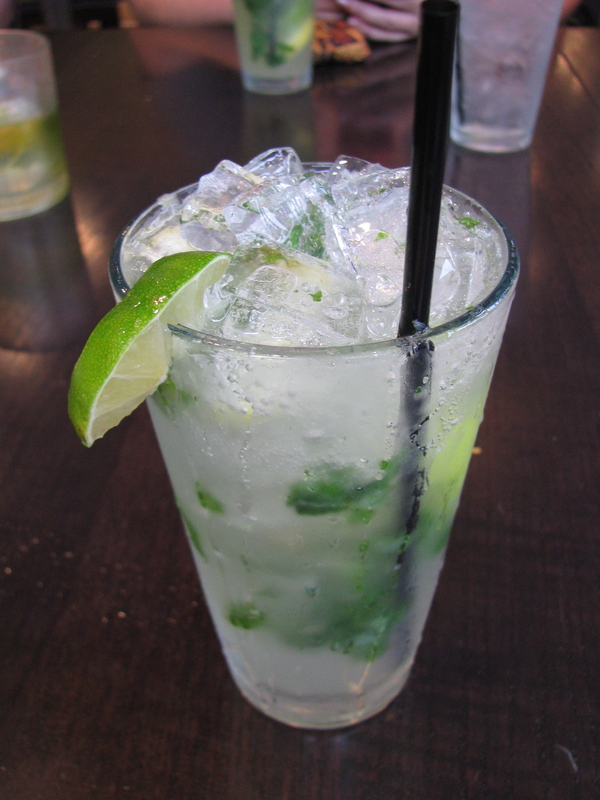 In fact, I might just make myself a mojito this afternoon to make a farewell toast to the summer of 2010. What have been your food highlights this summer? 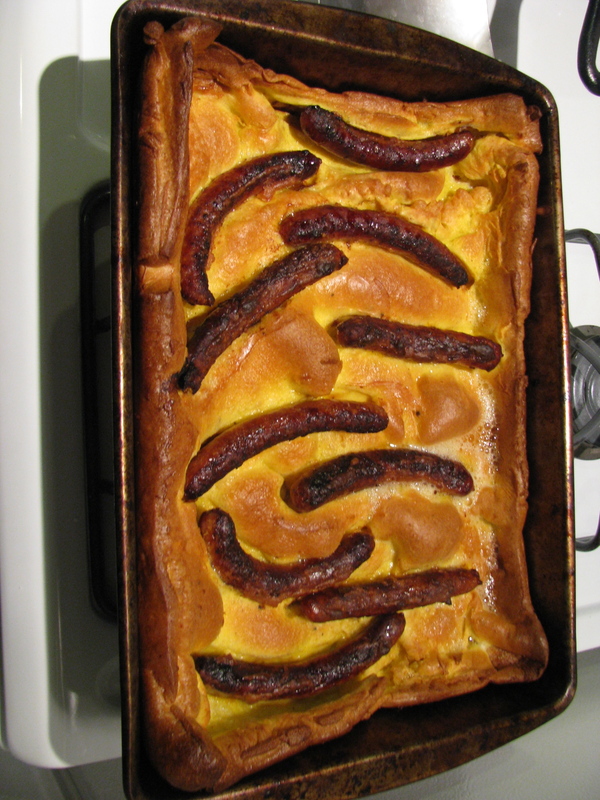 Toad in the hole is a very traditional English dish. A quick explanation if you haven’t come across it before – it is sausages baked into Yorkshire pudding batter and yes, I know it’s confusing that it’s called pudding. Yorkshire pudding is a baked batter that’s similar to popovers. It is often served with gravy. I ate Toad in the Hole growing up as it was a regular feature of our school dinners but it wasn’t something that appeared often on the menu at home, and I’m not sure if I have ever made it myself. 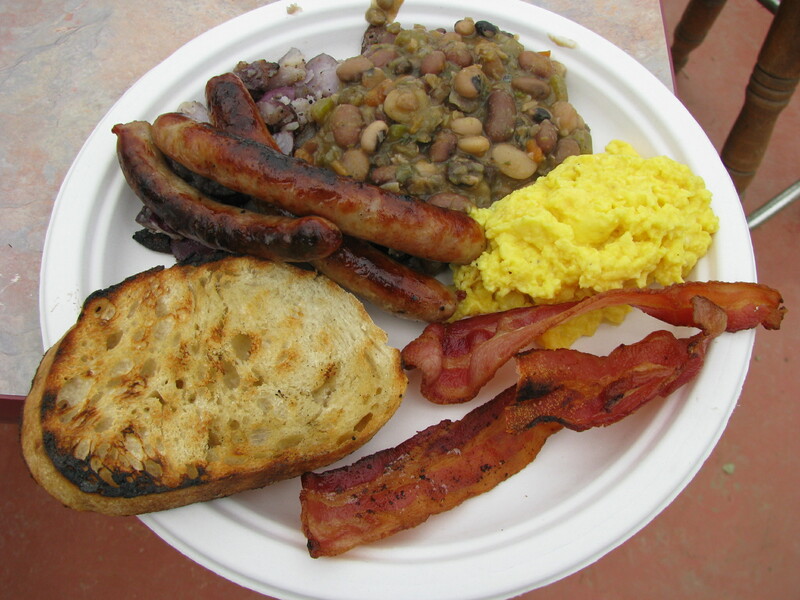 As you may have noticed, I haven’t had much opportunity to cook recently, but I was inspired by the Bluescreek sausages left over from our camping breakfast at the Flying J Farm and I had a friend coming over for dinner. It’s a simple dish, so I had all the ingredients and I liked the fact that I could make this traditional British food using my local Ohio eggs, milk, mustard and meat. 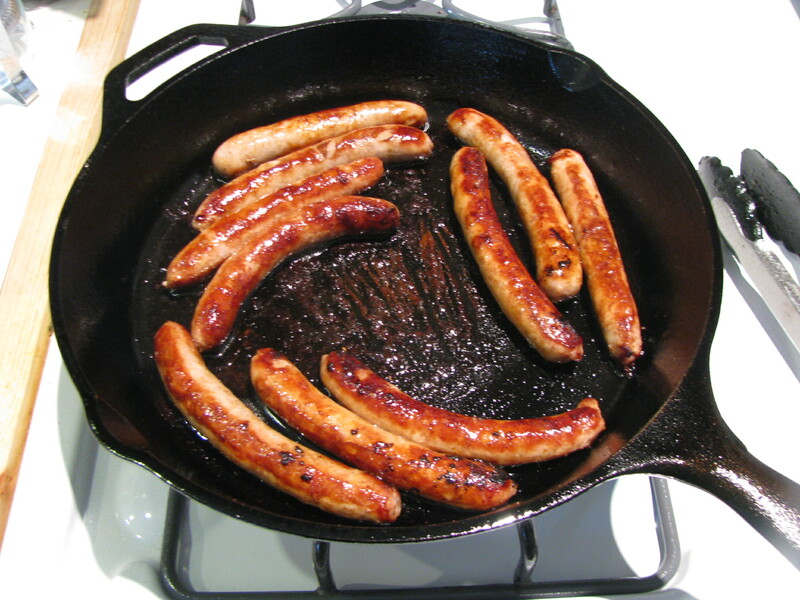 Heat the oil in the frying pan over a medium heat and fry the sausages until browned all over. Drain on a paper towel and then smear generously with ketchup or mustard. 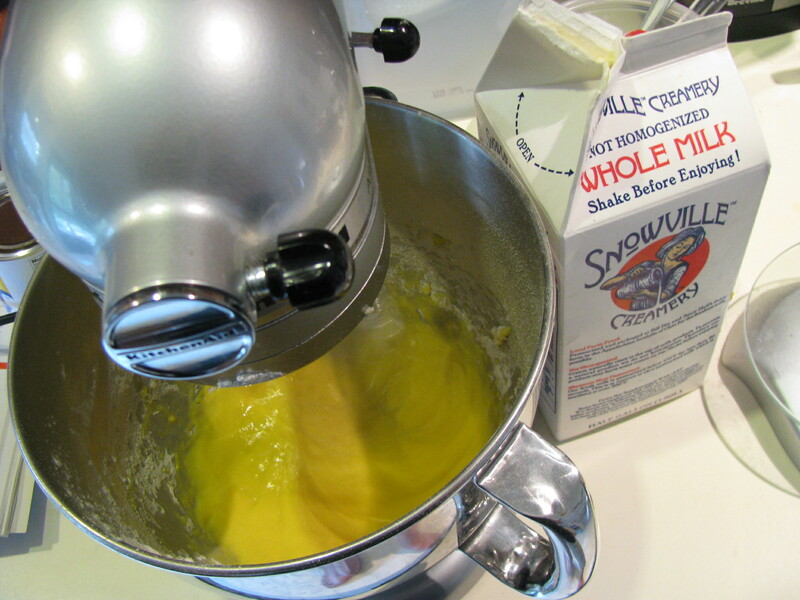 Put the eggs in a mixing bowl and whisk until thick. Add a little flour and a little milk and keep alternating until you have added all of them. Season, then mix in 75ml water and leave to rest for 15 minutes. Take a roasting pan that can accommodate all of the sausages in a single layer. Put the bacon fat in the pan and put it in the oven until the fat is smoking. Pour in the batter all in one go, and immediately arrange the sausages into it. Put the dish into the center of the oven and bake for about 30 minutes until it is puffed, crispy and a rich golden brown.